August 29, 2018 August 29, 2018 / J.K. It is a book about prayer, that is pretty clear from the title. There is a little bit of almost everything, prayer as it is in the Bible, a commentary on the Lord’s Prayer, notes from people in church history, differing prayers styles/times, and ways of doing prayer. Overall it is a good survey of most things related to prayer. The book is broken into five parts – Desiring Prayer, Understanding Prayer, Learning Prayer, Deepening Prayer, and Doing Prayer – with a few chapters per part, for a total of 15 chapters. 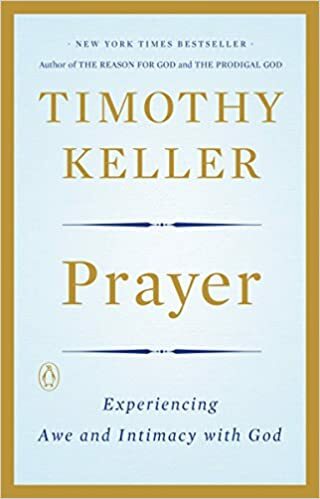 I’ve read a number of book on prayer recently for a sermon series, and as someone who occasionally writes, it is almost annoying the Keller once again has written the best book on a topic. The book is almost academic at some points, particularly the exposition of the Lord’s Prayer, while still remaining pastoral and accessible to most readers. I actually read only part of the book a year or so ago when I was studying the Sermon on Mount and heard his commentary on the Lord’s Prayer was one of the best, then finished this year while studying prayer. There is a good bit of discussion from people throughout church history (Augustine, Calvin, Luther) regarding prayer. I particularly enjoyed his ‘doing prayer’. This was the strength of the book to me. I’ve read many of the other commentators, and I know that/why we should pray, but I’ve always struggled with the how and especially with the habit of prayer. If that is you, the book is worth it just for that section and the resources in the back. The only weakness in the book is that Keller doesn’t really discuss unanswered prayers. Or at least, he doesn’t do it well. He isn’t ready to say that God doesn’t answer prayers sometimes. That’s a huge theological issue and maybe outside the scope of what he wanted to do, or just knows the answer is both simple and complex. Check out Yancey for more on unanswered prayer. Keller kind of hedges bye saying the answer can be yes and no. He gives the example of a girlfriend in college that broke up with him and him praying that it wouldn’t happen. He says the answer was no, as the girl did break up with him, but that the answer was yes because he eventually married his wife. I see what he is saying, and I appreciate what his view, however, this isn’t always the case. Some people may never be married; additionally, people die young from cancer, addicts can’t kick their addiction, etc. It is a hard topic, so I don’t mind that he failed, because what he does cover is covered so well. As I said earlier, the practice of prayer is handled extensively and is reason enough to get the book. If you are just looking into prayer as an intro, or your prayer life is stuck, or you are looking to go deeper in your understanding of prayer, this book is a must read.